No matter what phone you own, the cameras capture what you see. They won’t remove blemishes, dark circles, or acne from your face. If the picture is superb, it may have objects which you may not want the world to see. If it is horrible, you’ll either delete it or you’ll try to make the picture look better with a photo editing tool. Well, you don’t have to move your pictures from the mobile phone to the PC and edit it with GIMP, CorelDraw or PhotoShop. 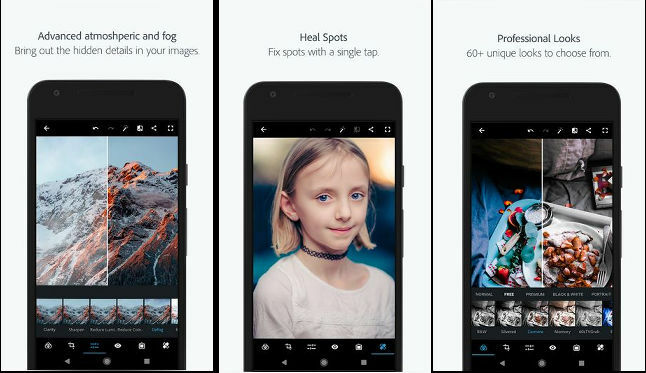 Google and Apple app store has plenty of free photo-editing apps which will fix image quality issues and make your selfies look great in no time. Among the plethora of apps on the app stores, we’ve shortlisted 6 great photo-editing apps for your mobile device. 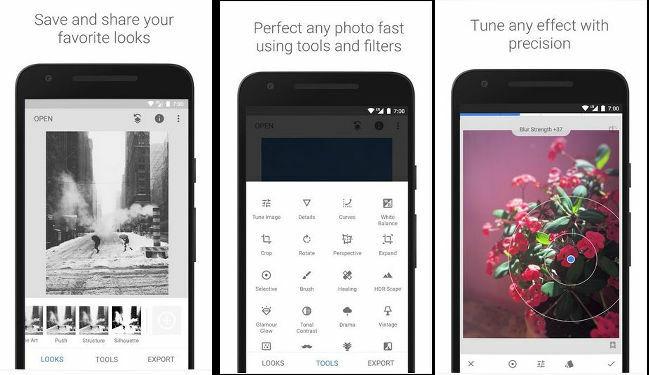 Developed by Google, Snapseed is one of the best photo editing apps for iPhone and Android devices. SS is easy to use application which has tools that you’ll usually find in the desktop photo-editing apps. It also offers many unique utilities. For instance, Snapseed identifies the face of a person and allows you to change its direction. It has a special feature called expand that increases the size of the canvas and fills the void space with the background. The Snapseed app offers 25 photo editing tools and has 15 unique filters. It supports RAW format pictures. It allows users to make changes to the pictures with swipe gestures. Snapseed supports undo and redo operation. It lets you save and share edits with other users via a QR code. The users that have received the QR code must open the picture and scan the code with Snapseed. When they do so, Snapseed will apply the edits to the picture automatically. Although Snapseed is a great app, it doesn’t have an autosave feature. Hence, users must save their edits before tapping on the back button. Snapseed lets users export the edited picture to their preferred location. It has the option to share the image on social networking sites and messaging apps. 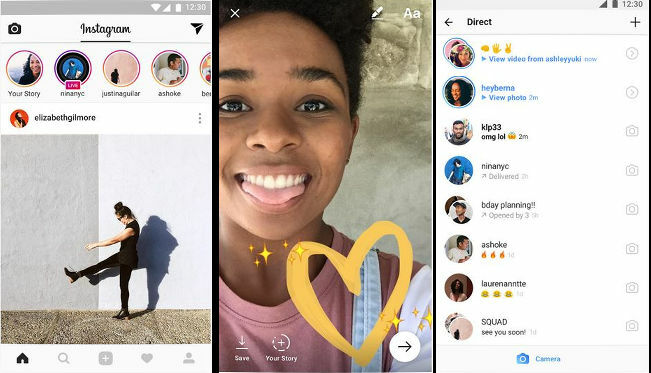 Instagram is a popular image sharing service that offers basic editing photo tools. The app provides different types of brushes and has numerous real-time filters. It features an eraser utility and includes an option to undo the previous edit/effect. Instagram allows you to see the original photo before saving its modified version. To see the original picture, users must tap on an image they’re editing. The app allows users to arrange the filters. You can also hide filters you don’t want to use. PhotoShop is a great alternative to Google Snapseed. It has over 50 million users and a superb rating of 4.3 on the Google Play Store. To get started with Photoshop Express and to unlock its full features, you must log in to the app with a Facebook, Adobe CC or Google account. If you don’t do so, you’ll get access to a handful of filters and tools. 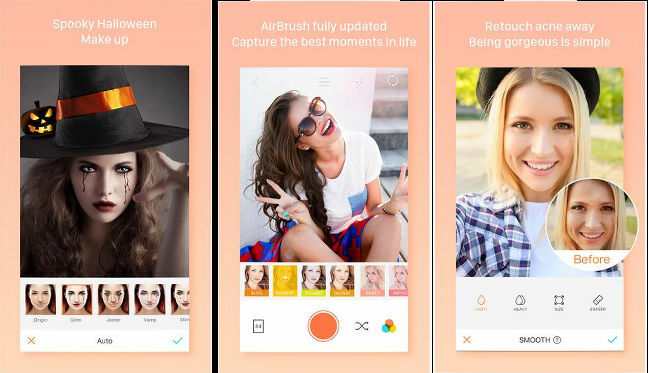 The app from Adobe gives users access to 20+ filters and has basic photo editing tools such as cropper, red-eye, skin blemish remover, image flipper, rotator, etc. The Photoshop Express app provides a Photo Enhancer utility which employs a smart algorithm to adjust the sharpness, color temperature of the pictures and make them look better. In addition, the app provides an option to adjust the contrast, brightness, color of images manually. The app lets you add borders of various styles to the pictures. 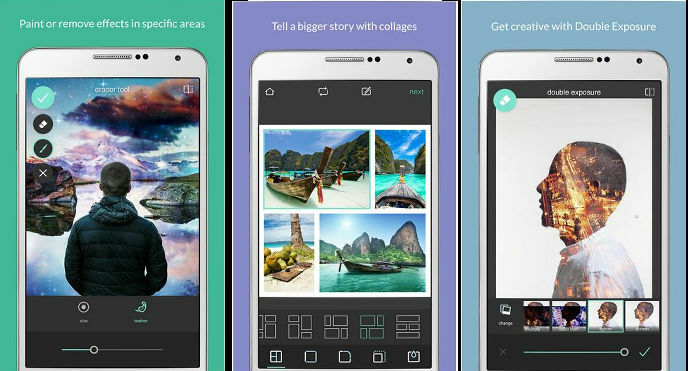 PhotoShop enables users to work with images saved on their phone. You can also import pictures from Adobe CC cloud service with this app. Adobe PhotoShop Express can add watermark to photos before saving them to your preferred location. It lets you specify the size and the quality of the exported image. The Pixlr app allows you to create collages of up to 10 pictures. It has 10 tools and 3 different customizable brushes. It lets you add doodles to pictures. Pixlr allows users to add overlays to photos. It includes 11 filters and an option to add frames to images. You can add text or stickers to images with the Pixlr app. Before inserting the text, users can change its font, color, orientation, etc. Pixlr enables you to bookmark and customize the filters. You can resize images and change their default saving size in the Pixlr app. Users can change the default image saving path in Pilxr. They can configure the app to start in camera mode. The Photo Director app can remove unwanted objects from the background of a picture. It lets you compare the edited and unedited images. Photo Director provides an Instafill tool which superimposes the picture on a new canvas and fills empty space on the canvas with a color of your choice or the blurred version of the superimposed image. Like other photo editing apps, PD allows users to adjust the brightness, contrast, and color of their pictures. You can put your picture on a train, billboard, front-page of a newspaper, screen of the theater with the Photo Director app. You can also create collages with this application. The app has various types of brushes. It has a skin smoother and red-eye remover utility. Photo Director lets you add stickers, beautiful overlays, borders, and text to photos. It provides 21+ effects. AirBrush is a great app to beautify selfies. The app can remove pimples, dark spots, wrinkles and dark circles from the face. You can also change the skin tone and add makeup to photos with this application. AirBrush can whiten the teeth and resize your nose, lips, eye or any other part of your body. It can make your face longer or wider. AirBrush offers 27 filters and it has the option to resize the canvas. Images edited with Airbrush look natural. Hence, you can use them as a WhatsApp or Facebook DP or share them on Snapchat, Instagram, etc. 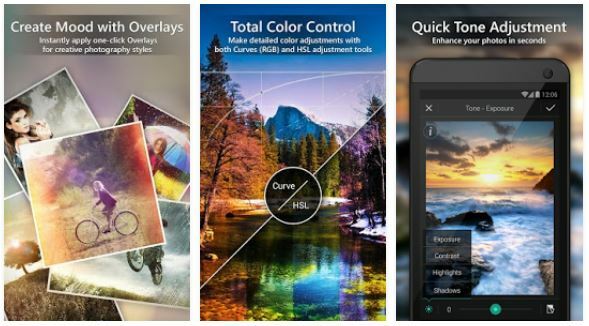 Adobe Photoshop Express, Snapseed, Photo Director, Instagram, AirBrush, and Pixlr are the best photo editing apps for iPhone and Android devices. These applications are fast and have plenty of features.